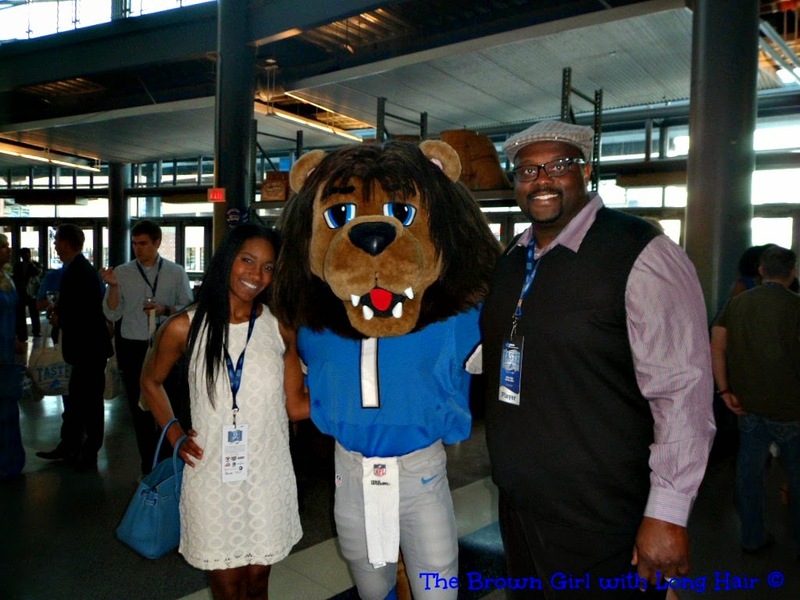 Scott and I were en route to Ford Field (again); this time to attend the annual Taste of the Lions, where gourmet food from the finest local restaurants, professional football players, and die-hard fans all collide amid the backdrop of an NFL stadium. Scott and I quickly ditch the VIP lounge in favor of mingling among the ever-growing throng of guests. The first familiar face we see is former Detroit Lions defensive tackle Luther Elliss, whom Scott played with for several years of his career. 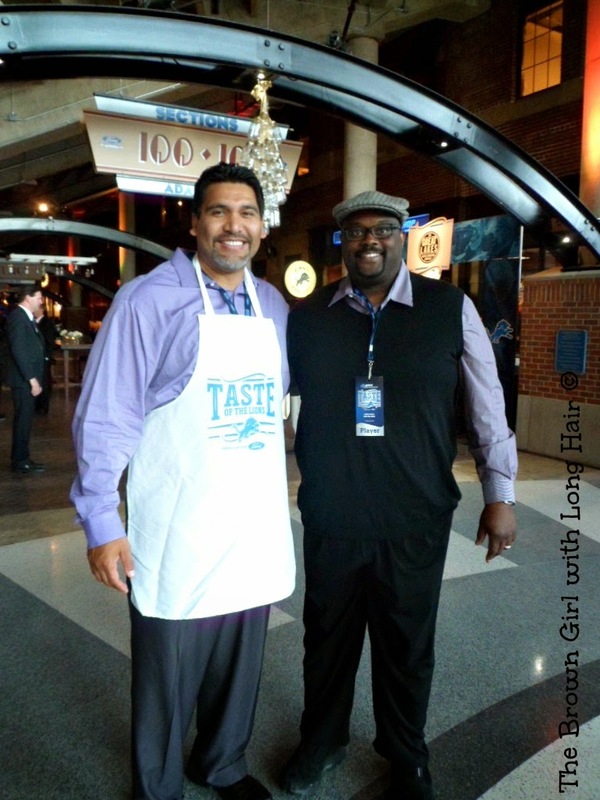 Next, we run into Joe Nader, the Executive Chef of the Detroit Lions. 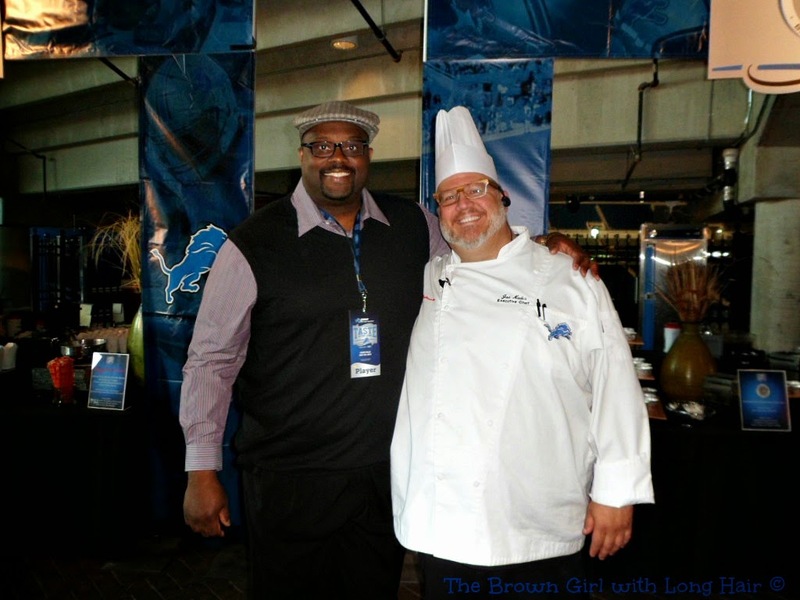 Very important is this man, as he oversees every aspect of food in Ford Field, including the suites, the restaurants, the concessions, and catering. Chef Nader always takes care of Scott and me when we see him and is the absolute best as far as hospitality goes. 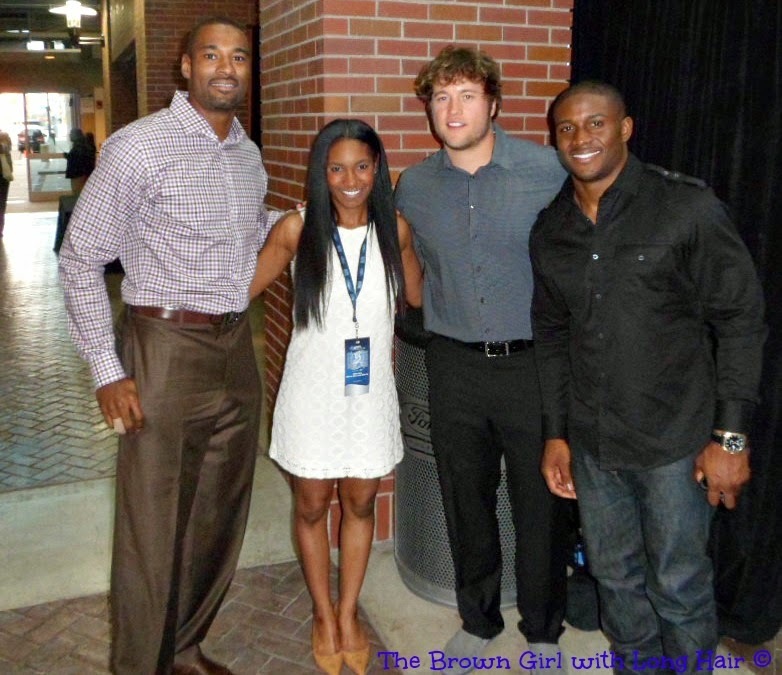 We then make our way to the locker room – as in the official locker room where the Detroit Lions suit up on Sunday – but today it’s the site of another private VIP hideaway. And guess who’s holding court outside the entrance? Mixologists from Sugar House, Detroit’s premier cocktail lounge. 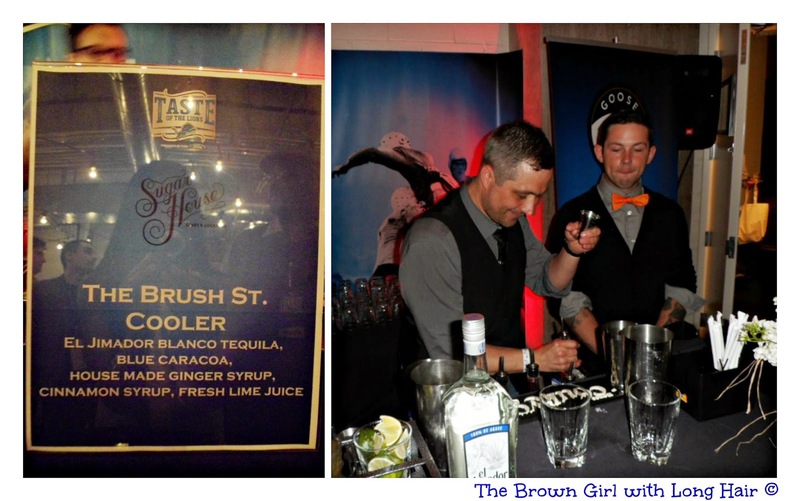 They’re whipping up a one-of-a-kind drink just for tonight called The Brush Street Cooler: El Jimador Blanco tequila, blue caracoa, house made ginger syrup, cinnamon syrup, and fresh lime juice, all of which is shaken to perfection and poured over ice. I had every intention of taking a picture of my glass so you could see how pretty this drink was, but, alas, my thirst got the best of me and before I knew it, it was gone. 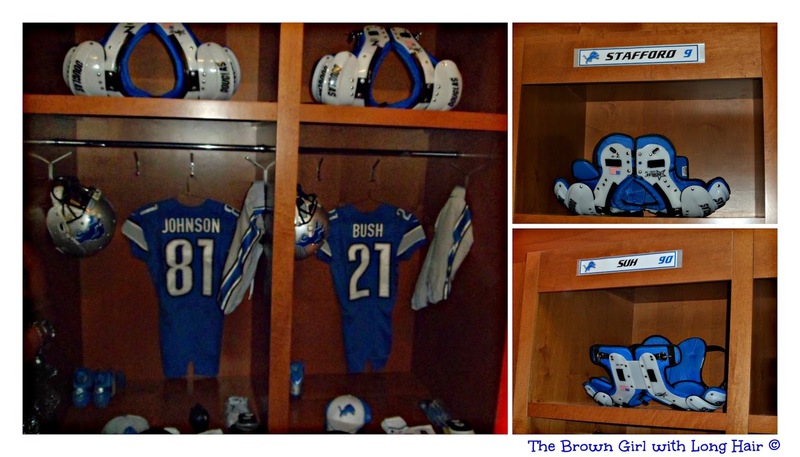 This is what an actual locker of a Detroit Lions player looks like. With its recessed lighting, sleek woodwork, and plush carpeting, it resembles a state-of-the-art conference room and is nothing like a conventional locker room where one might find metal benches and the stench of athlete’s foot. As soon as Scott and I exit the locker room (where we devoured the most delectable grilled prawn – YUM! 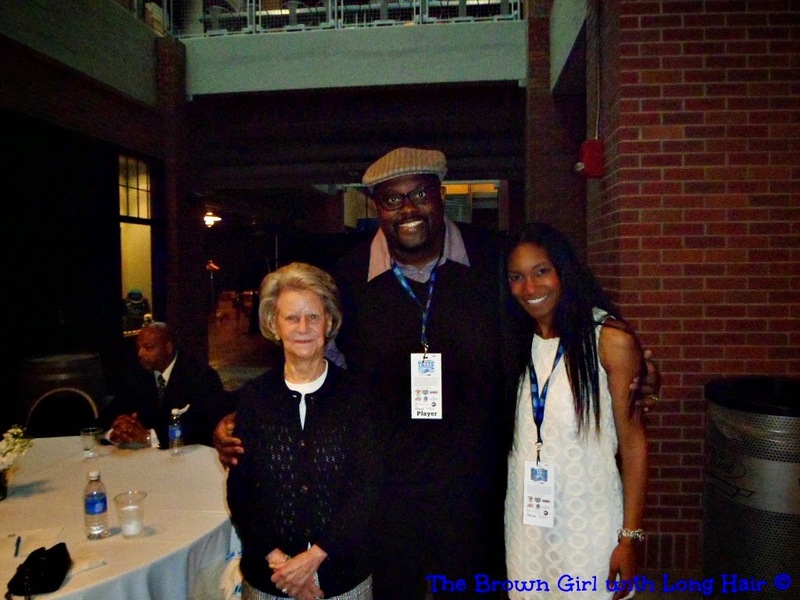 ), we run into this gentleman, Bill Keenist, Senior Vice President of Communications for the Lions. His title sounds Big Time because it is: Bill is the team’s chief spokesman on organizational matters and also leads the team’s football communications initiatives. 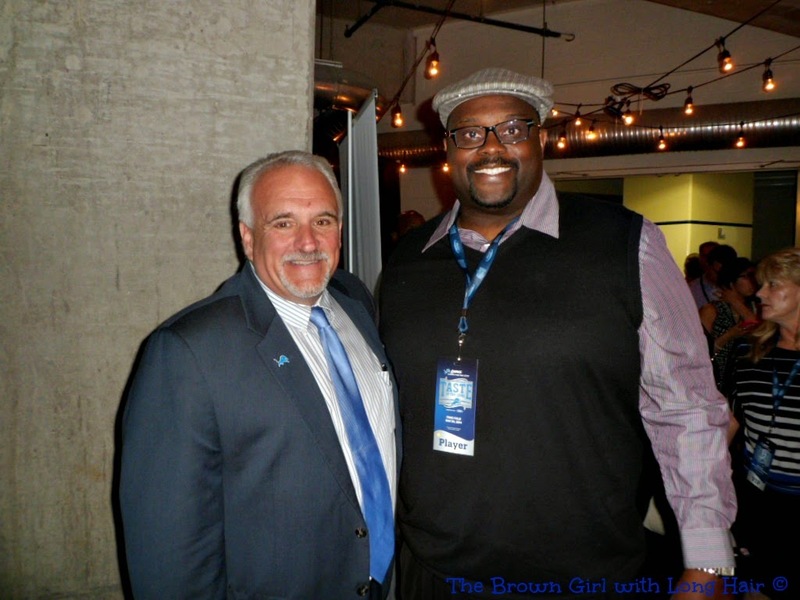 He was a member of Lions personnel back when Scott played, too, so he and Scott go way back. 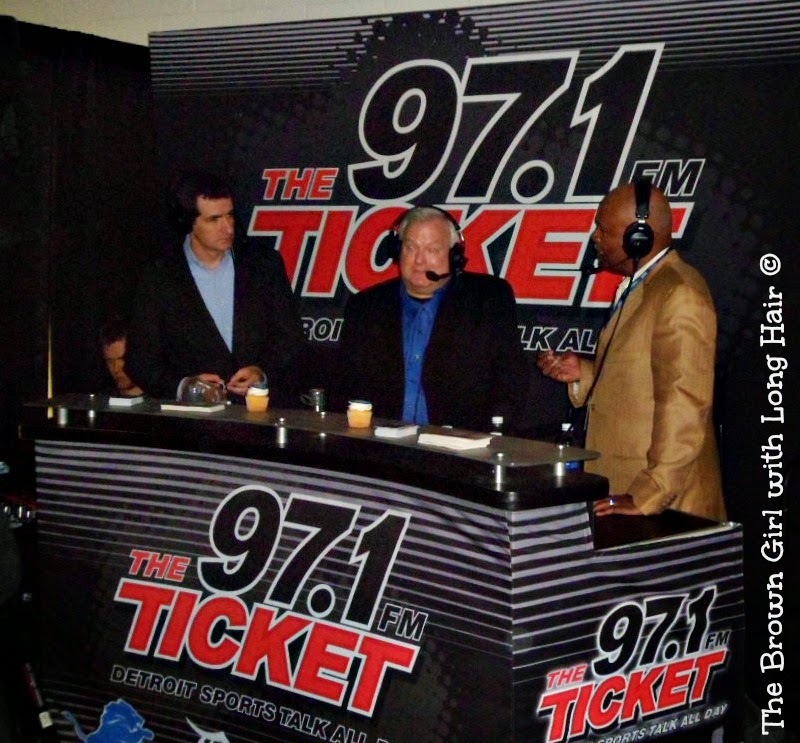 Bill asks Scott and me if we want to meet Jim Caldwell, the brand new head coach of the Detroit Lions. Of course, we do! So Scott and I hang tight while Coach Caldwell wraps up his interview with 97.1 FM The Ticket, which is airing live as we watch. 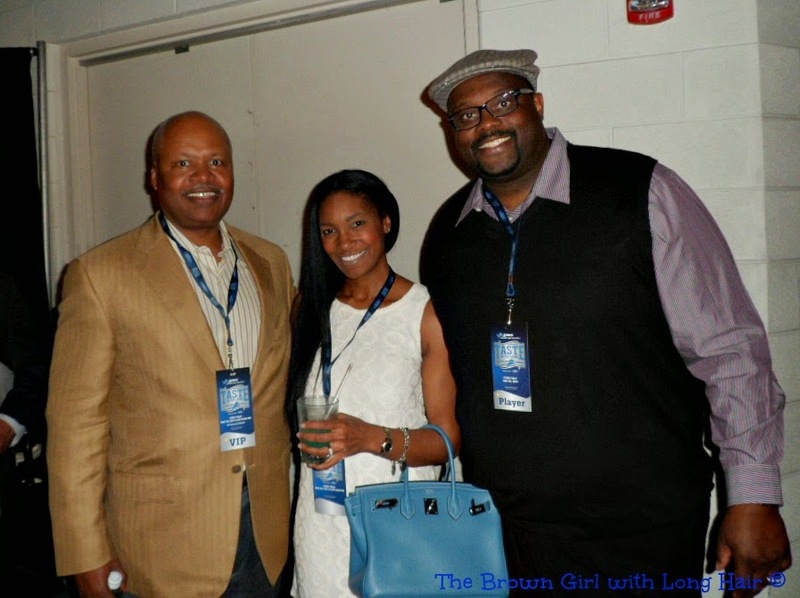 Then, our photo op arrives: Coach Caldwell, Scott, and me. In search of more food – we here that that a vendor, somewhere, is offering the best macaroni and cheese this side of the Mississippi, Scott and I head back out and endure the crush of equally hungry party-goers. And that’s when we see this guy, Rory, the official mascot of the Detroit Lions. Man, his teeth are white. Mmmmmmmm. 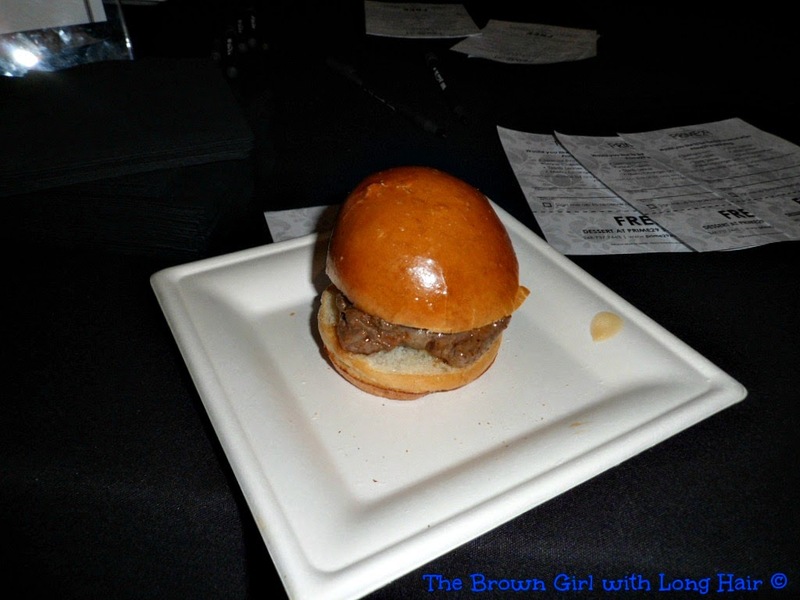 Filet sliders from Prime 29. 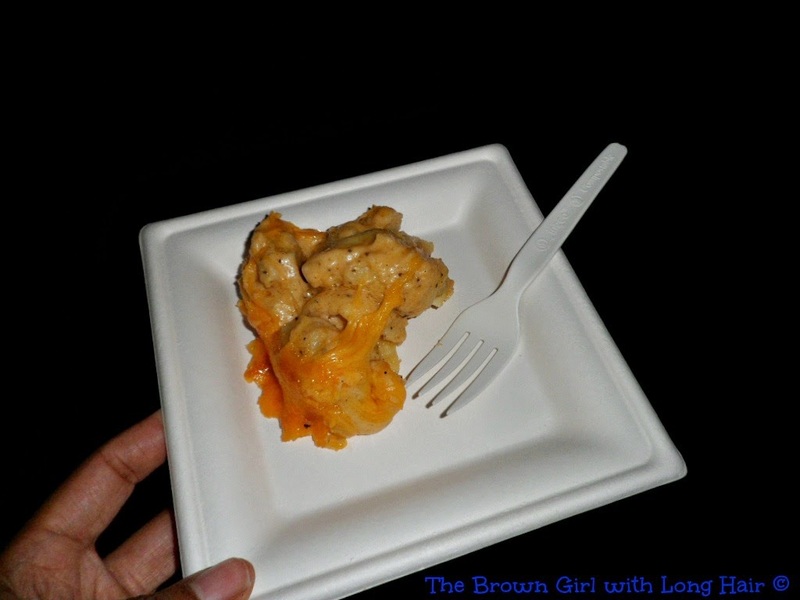 Mac ‘n cheese from Slows Bar B Q. I may never want to eat the boxed variety again. Scott and I were all but ready to leave the VIP lounge and head out to valet, when we run into these guys, who, like us, were just looking to take a break from the crowds and regroup: (From left): Detroit Lions wide receiver Calvin Johnson, aka "Megatron," (#81), Detroit Lions quarterback Matt Stafford (#9), and Detroit Lions running back Reggie Bush (#21). One last thing: This was all for a great cause. 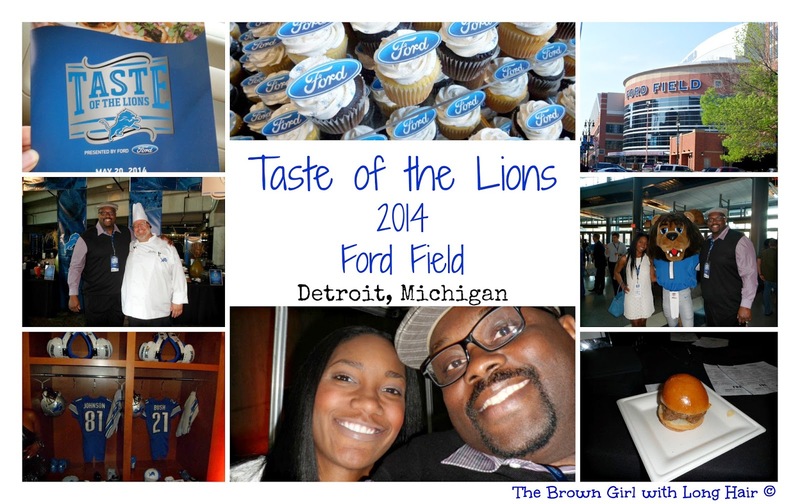 Taste of the Lions extends the league’s own Taste of the NFL program which began in 1992. The Taste of the NFL is held the night before the Super Bowl in the hosting city and brings together the country’s top chefs to raise funds for local food banks. Proceeds of Taste of the Lions will benefit Detroit's Eastern Market and the Lions’ community outreach programming, which improves access to fresh food options in underserved areas. Your dress is adorable, Courtney! I had no idea Ford owned the Lions. Looks like you two had a fabulous evening! I would have been taking cupcakes home with me to nibble on later! Thank you, as always, for reading and sharing such kind words through your comments. You truly make me smile! I can't handle how beautiful you are! Radiant! This sounds like such a great time, you are a total celeb! I would like to spend a day with this Joe Nader guy, can you imagine the food? yes, you can imagine because you are a superstar. The cupcakes are so cute too, how creative. However, the only thing more tasty looking than those cupcakes is Megatron #81. Whew! What a cutie. Oh, and, yes: Chef Nader can throw down. That's all I have to say about that! LOL about Megatron; he is a real gentleman in person. Thank you for stopping by and leaving such a flattering comment, Dina! What a great evening you had! And you look so cute in your dress Courtney! 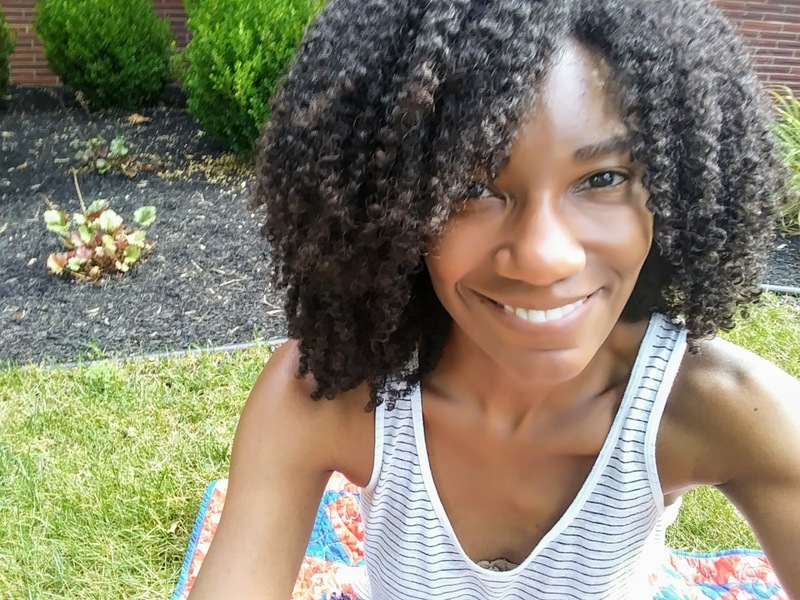 It's always great to be able to have some alone time without the kids. Mr. M and I are kidless this week and will be enjoying date night as well. OMG you were standing next to Megatron okay let me gather myself lol...looks like such fun + you look lovely and the cupcakes mmmm I'm a sucker for cupcakes....I'm glad you two had a great time. 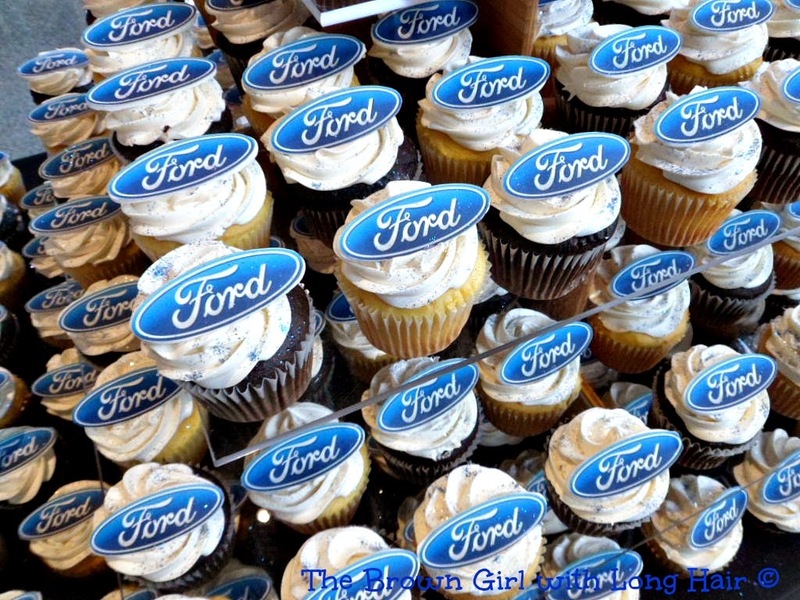 Can you believe that out of all the gourmet food we devoured that night, it always comes back to the cupcakes for me. I swear, if given the choice to have a hearty, fulfilling meal or, say, cake with buttercream icing, I swear, I will take the cake Every. Single. Time. Thank you for stopping by, Cookie. Courtney! I love this night. I laughed and cheered at your description of traveling to the party saying that you and Scott were on your own -without wipes and goldfish and bibs! What a fabulous evening out and those cupcakes look amazing (no clue before now that Ford was involved) as does the mac n cheese and prawns. Your dress? PERFECTION!! It looks like it was a blast! Thanks for sharing all the pics with us. I had no idea the locker rooms were that fancy. You really need to get out more. 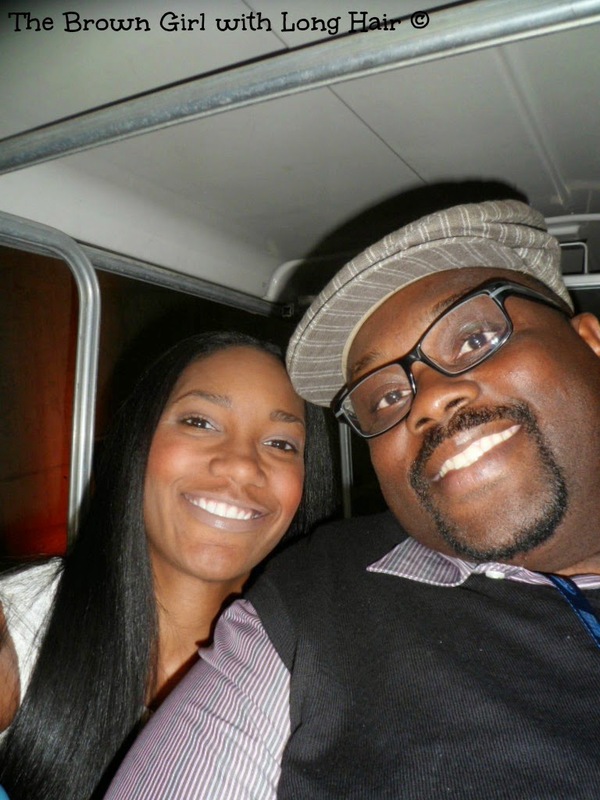 Have a weekly or bi-weekly date night and enjoy yourselves!! What fun!...although I am pretty sure that you violated some sort of parental suffering code by having 2 nights out in just 2 weeks. That aside, I loved the pictures and descriptions. I also want that slider and mac and cheese! Your thrifty clothing purchases boggle my mind. Guilty as charged, Susan. Did you check the by laws, though? 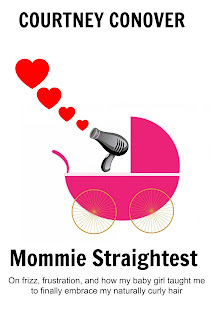 In The Book of Motherhood? It states in article 145-67-659 that "She who has suffered for months on end, wiping @sses for more than 30 consecutive months and nursing for 3x a night for months on end shall go out and enjoyeth oneself with reckless abandon...so long as she is back in time to commence with the nightly feedings all over again." It looks like you guys had a good time. Getting out of the house without being weighed down by kid stuff is always great. Through in some great food and good company and it's really a treat. You look great and I love your dress. Thank you SO much, Sonya! Ahhh, it was a great night. But guess what? Peace, Love & Blessings to you as well.